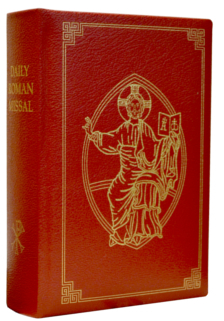 The Daily Roman Missal, Large Print Edition contains all of the same liturgical texts--antiphons, prayers, and readings--as in the standard print size and more. It is ideal for anyone, clergy or laity, who prefers a larger typeface, and it can be used by bishops, priests, deacons, and lectors in preparation for the Holy Mass. * Includes Eucharistic Prayers (I-IV), Eucharistic Prayers for Reconciliation (I-II), and Eucharistic Prayers for use in Masses for various needs (I-IV). ** Includes the Latin text for all Prefaces in the Order of Mass. *** Devotions and Prayers section not included in this edition, except for Prayers Before and After Mass - click on the button "PREVIEW" above to view the complete Table of Contents. Includes a protective slip cover.